To prepare for singing in sacrament meeting the Sunday before Easter (since Easter lands on General Conference this year), this Sunday we'll be learning Easter Hosanna and reviewing the song Hosanna (we sing this song every year, find my lesson plan HERE). Both lesson plans use handbells but if you don't have handbells, at the end of the post, I have Q&A's you can use instead (or in addition to the handbells)! Scroll through all of my Easter posts HERE if you need more ideas! When I teach songs using the handbells, I really like to keep the "teaching" aspect to a minimum. The kids are all just dying to play the handbells and want as much time with them as they can. I think the kids best learn the words simply by singing them over and over again. Which is great because using the handbells lets them do just that! But that said, the song still needs to be introduced. You can download them HERE. I own the actual Gospel Art Book (that you can purchase HERE or at any Distribution Center). See how I took mine all apart HERE so I can use it in primary (this is one of my favorite visuals!). 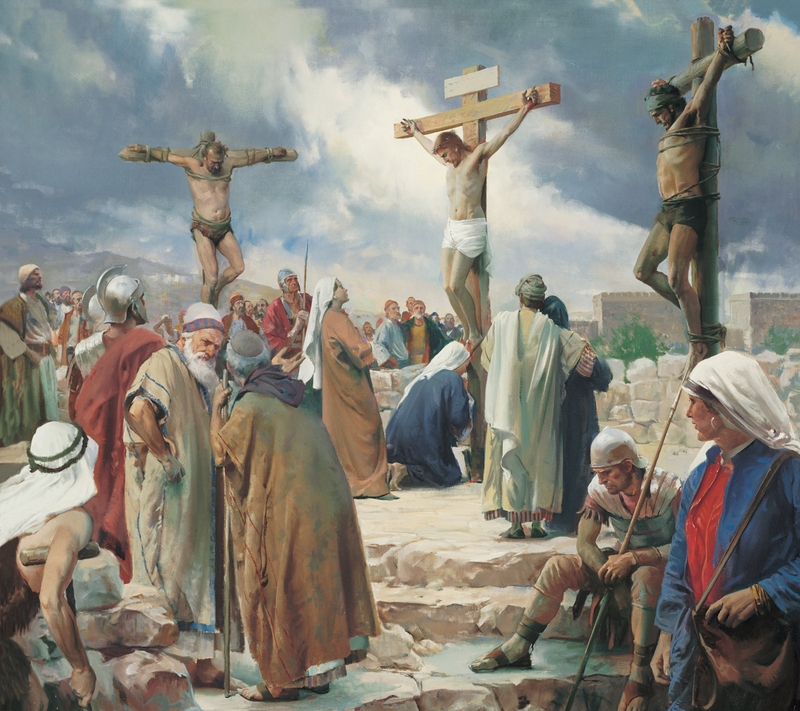 Show the picture of The Crucifixion. "When the Savior of the world was crucified, darkness, earthquakes, and destruction shook the earth. Jesus' body was placed in a tomb for 3 days. Then he arose from the dead as he promised he would. Jesus was alive again!" Ask the primary who Jesus visited [the Nephites] as they listen to the song on CD or as you sing the 1st verse to them. Hang the flip chart found HERE on the chalkboard or post the words like I do HERE so they can sing along if they would like. Afterward, show the picture of Jesus visiting the Nephites. Have everyone sing along with you and the piano using either the flip chart or the posted words. Bear testimony to the children that you know that Jesus Christ did appear to the Nephites after his crucifixion and you can read all about it in the Book of Mormon. You can now pull out the handbells (and/or begin the Q&A's at the bottom of this post). 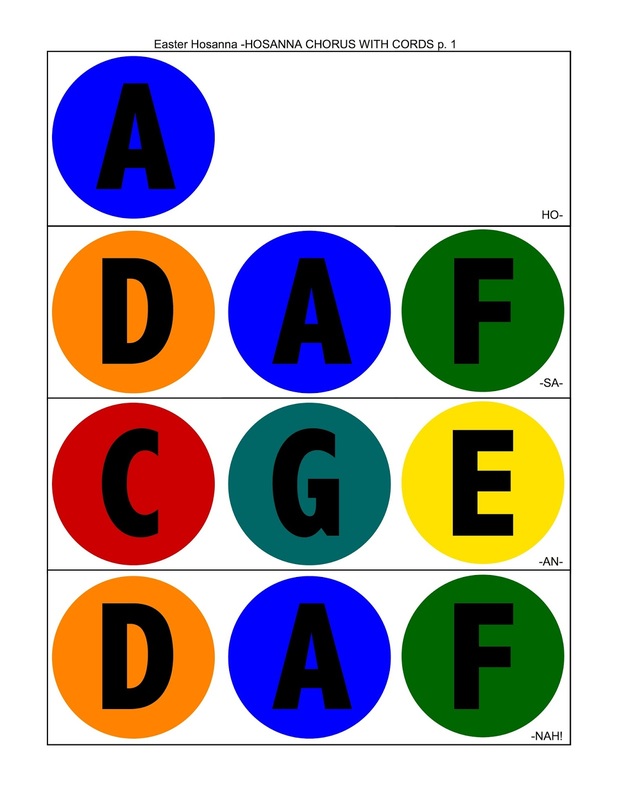 See how I use handbells in primary HERE. You will want someone to direct the singing while you direct the bell choir! I have 2 bell charts I created for this song, both for the chorus only (which is great because then you can reinforce the verses with no bells ringing!). Find them HERE. I'll only be using the 2nd version which uses the guitar chords on the "Hosanna!" Notice as you sing the second half of the chorus that it is the same tune as the first half (pitch lead to help give a visual), except for one word. Which word is it? [High] Sing the entire chorus. As I sing the first phrase, find a word that means that the prophecies came to pass or happened. [Fulfilled] Invite the children to sing this phrase. As I sing the next phrase, see if the melody is the same or different. [Same] Have the children sing this phrase and then add it to the first phrase. Now find two words that describe how Jesus looked. [White-robed and glorified] Point out the analogy of the descending scale: "as he came down from heaven..."